This is a big day for our flooring project. We expect the installation of our new floor will be completed today! In order to install the vinyl plank flooring, both of Scampy's fiberglass bench seats must be removed. The flooring will be laid in the area underneath these bench seats. 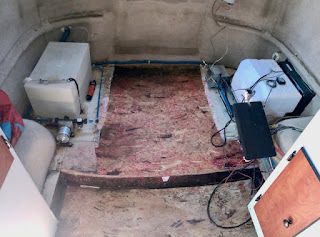 We have removed the bench seat containing our fresh water tank before. We have never removed the other bench seat containing our hot water heater and 12-volt converter. We do not expect any problem with these removals. Many months ago we ran over something that hit a drain fitting from our shower. The drain fitting was propelled upward and punched a hole in Scampy's floor. We must cover that hole before laying the vinyl planks. Stainless sheet metal in front of 1" hole in the floor. Sheet metal covering the hole. We just completed removing all the stuff that we Blogged to you about above. No unusual problems taking this stuff out. We have put everything removed out on the sidewalk. This is a commercial area. Hardly any foot traffic here. This flooring job will not be completed today as was estimated! At the rear, underneath where our table is located, there is a damp area of subfloor that needs drying out. Drying over nite should be sufficient. We will book a hotel room for tonite. Pano of Scampy stripped bare! 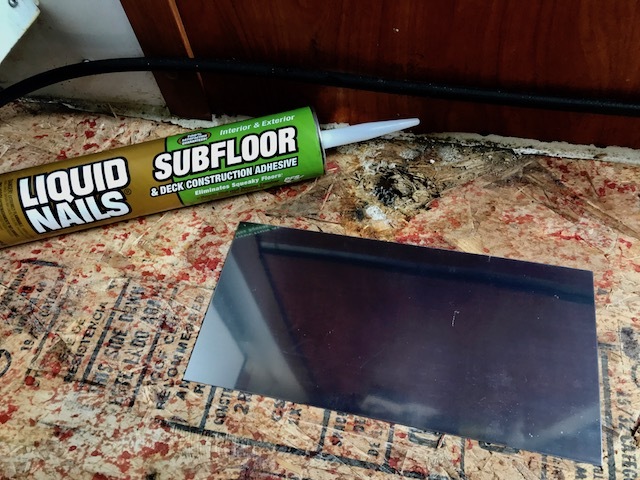 We believe that water that made the subfloor damp came from the filler or over-flow tubes. Now that those tubes are completely exposed, we will be able to figure out this leak business. They don't like Boid in Missoula! Hotels here in the City of Missoula are something else! We booked a room in the Campus Inn. We were already settled into our room. when we were notified to vacate. They will not allow Boid to stay. They allow dogs though. Go figure? Then we booked into Super 8 Motel. Everything was fine, and then we were told again, no Boid! Super 8 allows dogs too. Go figure X2! Then we booked into Motel 6. Finally, we found a hotel that allowed Baby Boid to stay! Yayyyy for Motel 6! Lewis and Clark Camped Here Too! A short distance away from my hotel room, a small river flows. Captivated by such waters as this, I stood above the river on a bridge. Just looking and marveling at the clearness of the stream. 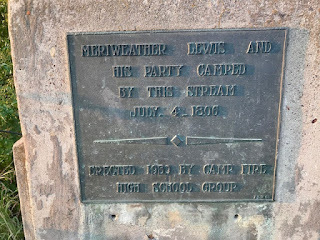 I noticed a stone slab with a bronze plaque attached. Wow! 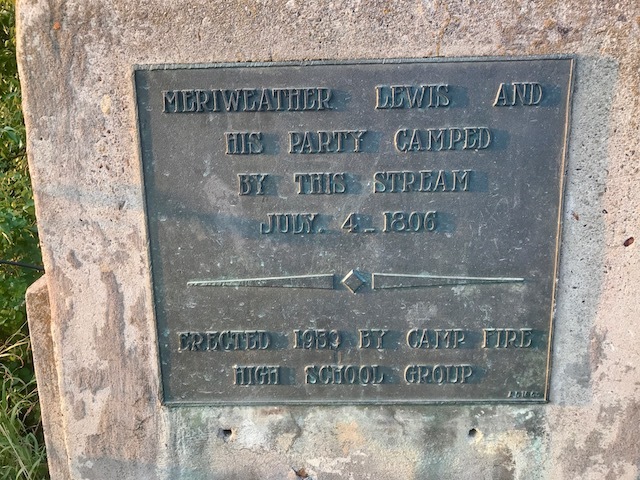 The Lewis and Clark Party camped here too. Doesn't that peak the imagination? 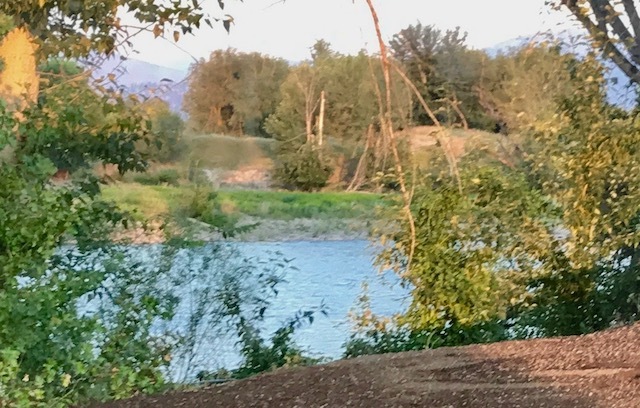 212 years ago, Lewis and Clark camped here! All that sheet metal for a 1 inch hole? Tsk Tsk! Are you exhibiting your critical attitude here on a public forum for all to see? The sheet metal was sold in the size you see in the pic. Did you want me to cut it down? I'm reading about the installation of your new flooring with great interest. You have me considering doing the same for my Casita. I can see you are doing a careful job that will result in a beautiful new floor that you will be proud of. Yes, I believe that I will be very happy with my new floor. The old cheap floor that Scamp Trailer provided, absorbed dirt like a sponge! [Shame, shame, Scamp Trailer!] By comparison, I expect this new floor to be very easy to maintain. Sue, the actual laying of flooring is the easy part. It's the preparation that requires a lot of planning and doing! 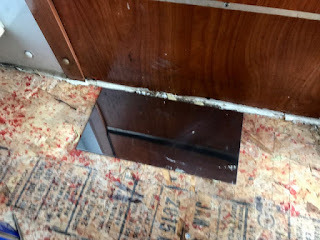 For example, Scamp Trailer filled in a gap below the toilet room door with an extremely difficult to remove white caulk. I must have spent an hour removing two feet of this caulking! It's the toughest caulk that I have ever seen! The gap below that door is due to poor workmanship on the part of manufacturing at Scamp Trailer. There should be no gap below the door. The door should sit tight agaist the floor. 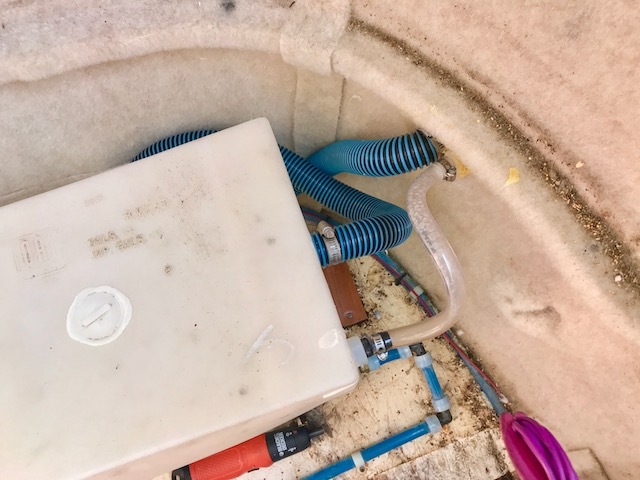 We send a Shame Shame to the people at Scamp Trailer for this sloppy workmanship! Sue, please excuse the opportunity that I took in replying to your comment to vent a bit at Scamp Trailer! They certainly do deserve it! I'm thrilled to have you vent in a reply to me, George. After all these years, I feel like I'm having a conversation with you! I don't think I will be as thorough in my preparations as you're being. I'm thinking it would be okay to remove the strip of vinyl/plastic moulding, put down the flooring, and then replace the moulding. I don't have a dinette so I suppose that requires removal. I had my trailer steam cleaned today. Now would be a good time for Scampy to have it done, if needed. Of course, that would complicate your life more. When you changeout your flooring, are you thinking to hire a professional to do the work? Probably not. I put down vinyl plank flooring in a bedroom which was more difficult than this small floor of my Casita. Now I'm wondering if we're talking about the same kind of material. The product I used then and would use for my trailer interlocks and can be cut to fit with a utility knife. The vinyl plank flooring that I am using is the interlocking type. The reason that I asked if you were going to hire a professional to do your floor laying job is that I have found that the preparation work is not easy! For example, disconnecting Scampy's two bench seats and moving those seats outside in addition to all the other myriad prep work is a long and hard job! It so happens that I am a peculiar kind of person who actually enjoys tough challenging work as this. Do you also enjoy tough challenging work? Like getting down and dirty doing muscling heavy objects in close quarters? If your answer is, "Yes! ", then you are going to have a good time laying the vinyl plank flooring yourself! I believe if one carefully inspected almost every RV/trailer made, they would all exhibit shabby workmanship, even the most expensive! I don't have any knowledge about overall RV quality. However, I do have personal knowledge about my Scamp trailer. It is my belief, that Scamp Trailer has no goal to produce the best trailer that they are capable of making. In fact, there is only one thing that Scamp does really well. And that is their fiberglass shell. ➜ A door lock that is a rotten design and allows the door to open on its own! Also, there is a pin that serves as an inside lock!? ➜ Vinyl flooring that has to be the cheapest crap that they could buy! This vinyl is very porous and acts like sponge for dirt! ➜ The bottom of the door to the toilet does not sit solid on the floor leaving a gap. Scamp used caulking to fill in the gap between the door bottom and the floor. ➜ The 7-pin connector cable inside my Scamp used no terminal strips for the hot side or the ground side. Just a mass of wires all connected helter-skelter in a ball of wire!! ➜ The kitchen sink should be made of stainless steel. The drain fitting should be stainless as well. The sink is some kind of plastic. The drain fitting begins to corrode immediately! There's more. But why go on? You get the picture. I do believe you. And, I agree with you. I did not cut down that blue hose because I was concerned about reattaching the hose after cutting it. But the hose being long does not cause the leak. Why mention that length? 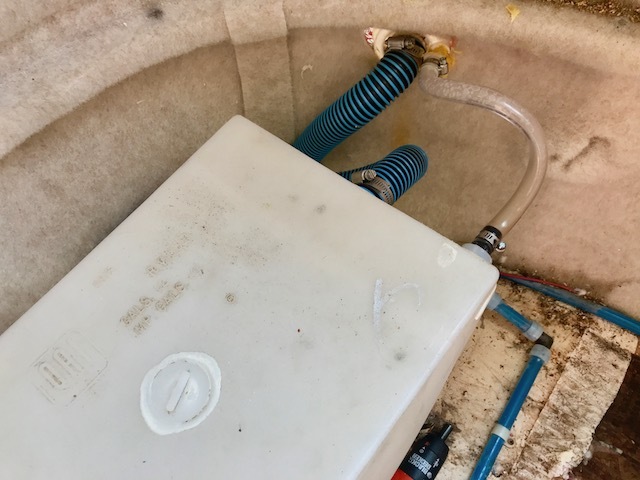 When you go to fillet the next time the water that you're putting in has to overcome the pressure of the water and the water pocket , it's not free flowing. You are thinking that the exterior cap forms a seal over the filler tube. It doesn't. This is all inexpensive plastic stuff, Ed. No vacuums exist in such plumbing as this. I'm sure you plan to test the water filing system while the floor is out and you can see where the leak is. Best of luck with your project! Absolutely! Now is the time!